Appreciated for its juicy orange flesh, sweet taste and fragrance, the mango is the most widely consumed tropical fruit in the world, after the banana. Originating in South-East Asia, where it has been cultivated for thousands of years, it is considered by the people of that region as the absolute ‘king of fruits’. It arrived in Europe only during the 17th Century, when the English imported it from India. The Spaniards and Portuguese introduced this fruit in America around the same time. 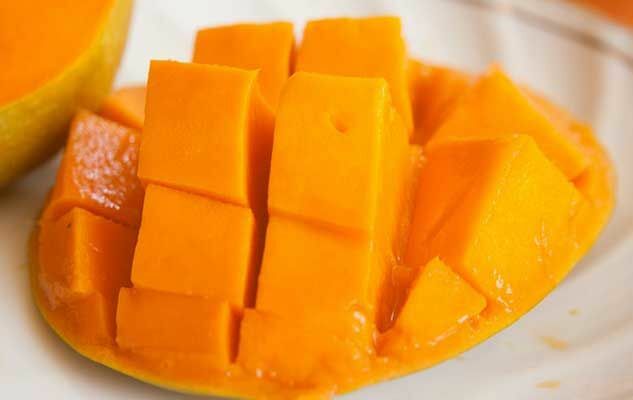 The term mango derives from the Tamil (South Indian) word mānkāy. This delicious fruit, which is available almost all year round in grocery stores, is one of the best sources of vitamins A and C. It also contains potassium and copper. Select a ripe mango, one that it is fragrant, with a smooth and unbruised skin, and whose flesh faintly dimples when pressed with a finger. As mangoes spoil easily in the cold, it is better to preserve them at room temperature. However, they can be frozen. All you have to do is to peel them and cut the flesh into slices and pop them into an airtight plastic bag inside the freezer. Originally published in the Journal de Montréal on March 13, 2010. Thanks to Sharing about Mango. and Mango Recipes..